We are currently living in a time when people are willing to spend a little time and money to make sure that their pets remain healthy at all times. This is why domestic animals are now starting to live longer and much happier lives. 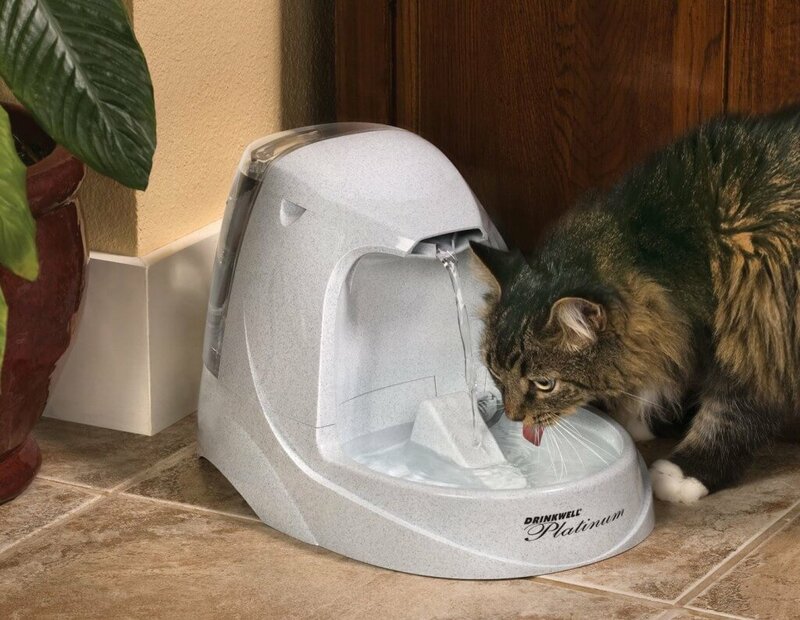 Cats now are able to have clean and healthy water thanks to the recent rise in the number of cat water fountains on the market. A lot of these fountains are able to filter water so then cats are able to have a healthy drink of water without any concerns for their health. 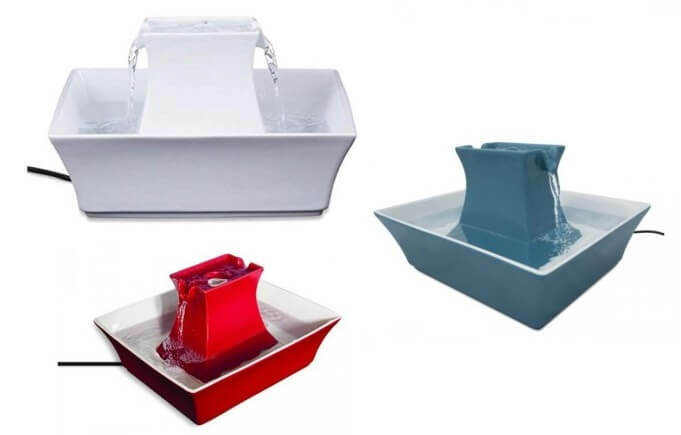 Drinkwell is a company that has shot to the very top of the cat fountain market with their range of products, most of which are able to fit perfectly into the majority of domestic scenarios. However, it is possible that the wide range of choices offered by companies like Drinkwell can leave you feeling a little overwhelmed with which cat fountain to buy. 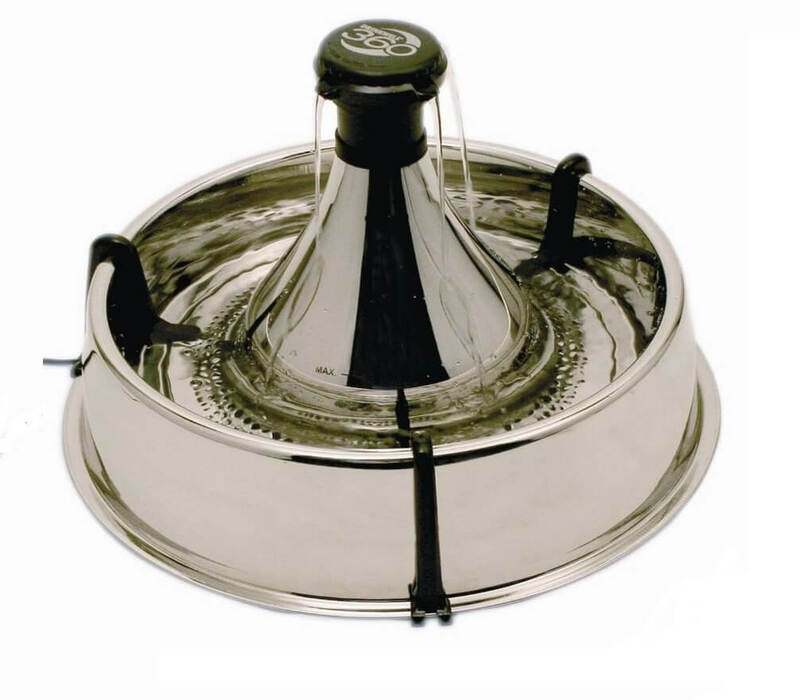 Here we will take a look at four of the best cat fountains that Drinkwell have on offer and we will also answer some questions you may have so then you can make a more educated decision for you and your cat. This is one of the more popular cat fountains offered by Drinkwell and for obvious reasons. This rather appealing fountain is made of ceramic material, so it is able to fit into almost any domestic surrounding. It can sit happily in a kitchen for example and not look remotely out of place. This fountain comes with the usual charcoal filter, so then any bad tastes and bacteria are cleared away for a healthier drink. This fountain also has two areas where cats are able to drink, so there is no need for several cats to be fighting in order to get a drink. The only problem with this cat fountain that some customers have expressed concern about is the pump. Some people who have purchased the cat fountain say that the pump has given out after a few months, even after a few days on some occasions. These customers however also stated that they had the pump set on a timer of over 10 hours a day. It is probably best that you check the operational instructions to see how long they recommend the pump be on for per day, as 10 hours could be considered too often. Cleaning the pump on a semi-regular basis will also reduce the risk of it breaking down. This cat fountain is very easy to keep clean, mainly because it is made of ceramic material. If you are able to keep on top of cleaning it and give it a proper cleaning on average once a week, then you should be able to keep the cat fountain looking like new for a very long time. It doesn’t even take that much effort when you are washing it by hand in the sink to get it nice and clean, so this is certainly something that makes this cat fountain look even more appealing. No, it does not. This cat fountain does not have the ability to detect where the water level is, so the pump will continue to run regardless of how much water is inside. You have to be very careful though, as running the pump in low levels of water can cause it to burn out rather quickly. The best thing to do is make sure that the water level stays at a certain height for the majority of the time. If you have just one or two cats, this is something that will not be too much of an inconvenience. This cat fountain is quite different from the one we have just looked at. While the previous fountain had two separate areas where cats are able to get around and have a drink, this fountain has a round drinking area that encompasses the entire fountain. This makes this an ideal addition to a home with several cats, or indeed a home that has cats along with other domesticated animals that might want to crowd around and have a drink. 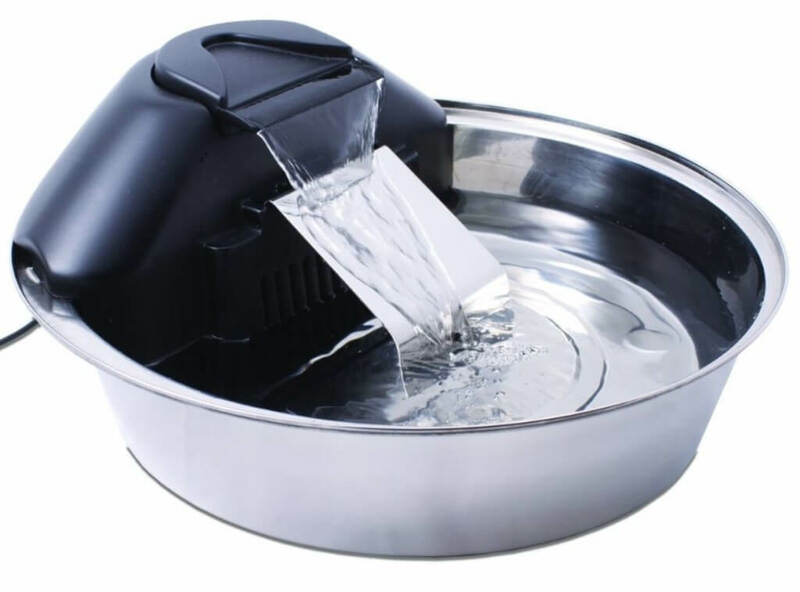 You can also adjust the flow of the water so then it is flowing at a level that is ideal for you and your pets. Cleaning this cat fountain is something that can be a slightly difficult task. It is recommended that you give the fountain a good cleaning at least once a week, which naturally involves taking it apart so then you can make sure that every aspect of it is clean. This can be a little tricky with this being a more complicated drinking fountain, so it can lead to a lot of time being spend putting it back together. This is something though that naturally becomes easier the more often you do it. Soon enough, the fountain should be nice and simple for you to put back together after you have given it its thorough weekly cleaning. This fountain is very quiet and you will probably only be able to hear the motor or the pump during specific situations. If you have had the cat fountain for a while and it has suddenly started making a noise, then chances are that there is just a little adjustment that needs to be made. Sometimes it is simply that the pump has slipped a little out of place and needs to be nudged back to where it should be. Most of the time however, the noise will probably be caused by the water level dropping down too low. Make sure that it is mostly full for the majority of the time to avoid this happening. There is no need to take the fountain apart in order to add more water. In fact add water is a really simple task. All you have to do is pour some water into the fountain and the filter will get to work making it clean and healthy straight away. 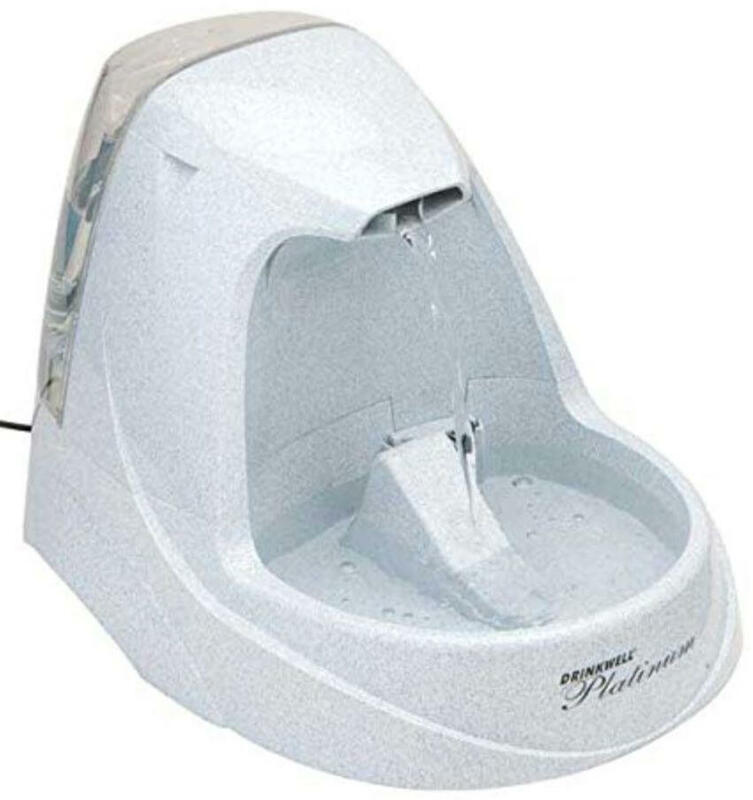 While the previous cat fountain we have seen is ideal for a domestic environment that has several cats, this fountain is able to support many animals based on the amount of water it is able to hold. 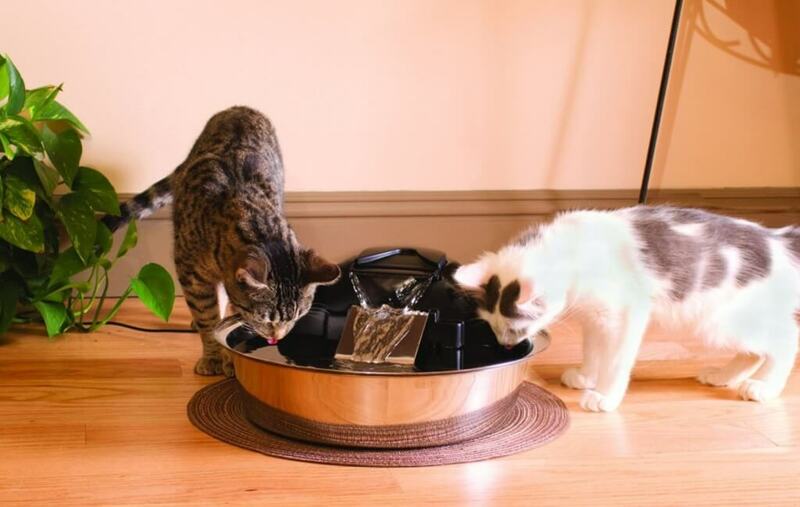 This cat fountain from Drinkwell is able to hold an entire gallon of water, making it ideal for households with several full grown adult cats or several domesticated animals that might be wanting a drink on a regular basis. This fountain even comes with a ramp for the water to trickle down, so then it makes the minimal amount of noise and splashing when the motor and filter are running. Because this is a larger fountain and it is designed to house a full gallon of water, the charcoal filter that comes with the fountain does get plenty of use. This means that if you are used to leaving your filter in for a month or maybe even a little more, you may find yourself having to change the filter more often. This is simply because of the amount of water in the fountain. If you are able to change the filter on average every two or three weeks, then the water should stay clear and healthy for the majority of the time. It is recommended that you clean this cat fountain at least once a week, or maybe even longer depending on the amount of animals that are using it. Naturally, because of this you will want to be able to take it apart and then put it back together again during cleaning with ease. The good news is that this cat fountain is very easy to take apart and then put back together again, making cleaning a very easy process. The only thing you may have trouble with is the rubber gasket, but that is something you will find easier to deal with the more often you clean it. If you have the fountain turned on without any water inside it, then it will almost definitely burn out the motor. The important thing to remember with all cat fountains is that there should always been water inside, which is why it’s important to keep an eye on the water levels on a daily basis. This fountain is considered to be one of Drinkwell’s top sellers. It also has a rather unique design which makes it look a lot different to the other fountains offered by Drinkwell. This fountain creates the image of free falling water, which is considered to be very beneficial for animals as they consider this to be an appealing sight that encourages them to drink. This model also has a built in reservoir so then you can store more water inside the fountain. This fountain in fact can hold 1.3 gallons of water, which is even more than the one we looked at previously. Again, just like the previous model we looked at, because of sheer volume of water that it is able to house, it means that the filter and the motor will be used on a regular basis. This means that you will need to change the charcoal filter at least once every three weeks or possible once a fortnight. When it comes to the motor, you will not want it running for very long periods during the day as that increases the chances of it burning out. Another good idea would be to give the filter container and the motor itself a cleaning when you clean the rest of the fountain in an attempt to keep it running for longer. Yes, there is no reason why you can’t use this outside. 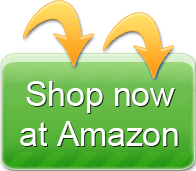 As long as it you are able to plug it in at a nearby plug socket or use an extension cord then you should be fine. Naturally, this is still a piece of electrical equipment, so it is important that it is under cover when it is outside as getting caught in the rain would break it beyond repair. In many cases, the fact that a cat fountain is able to hold a gallon or more of water means that it is probably too big for kittens to use. This is usually because the fountain has been designed for adult cats and larger domestic animals like dogs. This fountain has a nice low edge so kittens will be able to use it in comfort. There is also plenty of room for several kittens or smaller adult cats to fit around and have a drink at the same time if they want to. 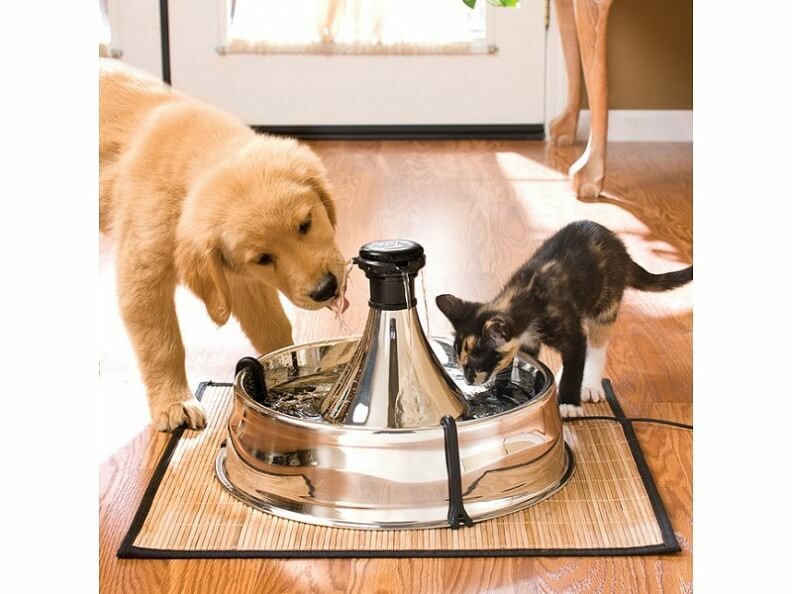 With products like these, it’s easy to see why Drinkwell has quickly become one of the leaders on the pet drinking fountain market. Their range of fountains are ideal for practically any cat. They also have several models so then you can find the right one for you, whether it be for several large cats or even for several animals wanting a drink at the same time. If they can keep producing products like this, then Drinkwell will remain at the top of the market for a long time to come.